Each edible art creation is hand-made. While the design above is the style and size you will receive, no two are ever the same. Each edible creation is uniquely one-of-a-kind!! The cockpit is full of candies & cookies. A personalized flag can be added if you like, as pictured. Just choose it by filling the the Personalization Box above (maximum: 2 words). The default design has no personalized flag. Shipping is not possible!! 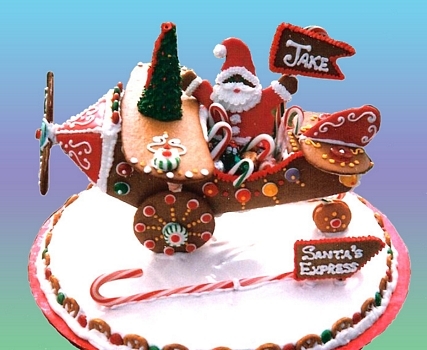 Gingerbread is made for Local Pick-up or Delivery arrangements may be available Gastonia & Hickory, NC.